Winter is far away already since we had such lovely weather in Belgium the last 4 weeks. Sunshine, warm temperatures and a good breeze for sailing. So let’s go for a quick recap of our start of the season so everybody is again up to date! First of all I would like to introduce you to Arnout & Klaas Viktor. 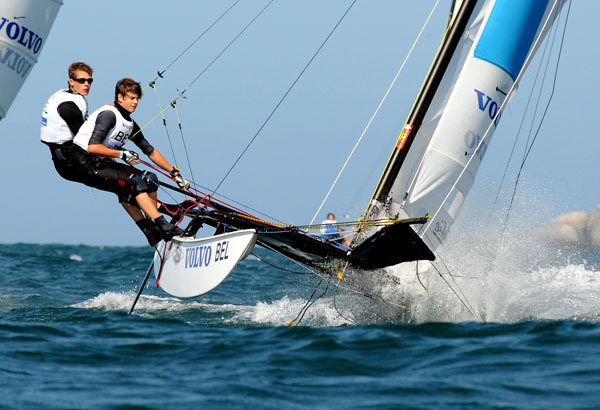 These young Hobie 16 sailors are going to sail a Falcon F16 for us this season. We are very excited to have this young talented guys sailing the Falcon. We already had 3 training sessions with them and they rock. They mastered the boat very quickly and they are able to get the maximum out of the boat. This weekend Arnout will be sailing the Paascup at VVW Heist, unfortunately not with Klaas but with a stand-in crew. We will be there too and we look forward to see how things will run along the race course. We have also been very busy with TheBoatShop.be, unloading containers and putting Falcons together. This weekend we delivered the last Falcon in Belgium, in Oostduinkerke. We showed him how to rig and derig and Gill took him along a test ride. Next day we already got a text thanking us and he already went out again on his own and he had a great ride and was very happy. We love to hear this feedback! Test sails were also on the agenda this month. We had a very good turnout and lots of nice feedback and interested people. Last Sunday we had a training sessions with Harry Michel Peeters and we learned a lot. First of all we learned the next day where to find our muscles :-) Ouch beginning of the season and lots of tacks and gybes made us feel old the next day. We practiced starts, we tacked 10 times in a row each time Harry Michel blew his whistle and we did a race to finish the day of training. Afterwards a debriefing to let us know where to improve. We are ready for our first race of this season: the Paascup at VVW Heist, this Saturday. Let’s hope for a good turnout and perfect weather (sun and wind!). As of now we will be back soon with lots of updates on our racing season. Stay tuned!